The Atlas presents an afternoon of silent films accompanied by live, original music. Welcome friends! Baseball is back, Bryce is gone and we are moving on with our lives. He’s just not that into us and we are FINE. How are we moving on this weekend? Tonight, learn how the literal sausage is made (I am pretty sure I have made that joke before. Sorry?) at Union Market’s Test Kitchen. Join Harvey’s Market owners George + Marty and local chef Jennifer Jones for a hands-on lesson on sausage making. You will learn to make some sausage and test some too. There will be some crostini and wine too, so you can go ahead and call it dinner. Tickets are $65 and the class starts at 7 p.m.
Friday, DC’s very own “contemporary cool king” saxophonist Brad Linde brings his latest band DIX OUT to the Atlas Performing Arts Center to celebrate the release of their debut album “There’ll Be SOME Changes Made,” featuring songs from the 1920s trad jazz repertoire. Tickets are $13-$30 and the show begins at 8 p.m.
Saturday, the H Street Farmer’s Market returns for a 16th season! The market is held every Saturday from 9 a.m. – 12:30 p.m. at 800 13th St NE (corner of 13th and H Streets, north side). Several favorite vendors like Full Cellar Farm and Quaker Valley Orchards will be back as well as a new addition, King Mushrooms. The National Cherry Blossom Festival hosts Petalpalooza at the Wharf. From 12 noon to 9:30 p.m., there will be a full day of art, music, and other family-friendly activities along the river. The all-day event concludes with a fireworks spectacular. The event is free and open to all, though maybe don’t drive there? Sunday afternoon at the Atlas, go back in time with a slate of silent movies accompanied by live music. Atlas resident curator and musician, Andrew Earle Simpson has created an original score and he will be joined by an ensemble. 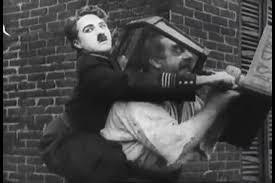 The films planned are Easy Street (1917), directed by Charles Chaplin, Liberty (1929), starring Laurel and Hardy, Too Many Mammas (1924), starring Charley Chase, Picking Peaches or His New Mamma, starring Harry Langdon. Tickets are $20 and the screening begins at 4 p.m.